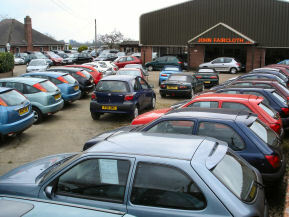 A family run used cars dealership that has been in business since 1936 approaching 80 years from the same address based in Norwich. John has been serving customers since the age of 6. and knows that there is an ever changing market to suit peoples needs. We usually stock in the region of 50 good quality used cars at competitive prices, you can rest assured that buying a car from us, means that you will be fairly treated on the trade in price as well as the selling price. We sell all makes and models of vehicles from family saloons, hatchbacks, estates, sports, 4x4 to MPV's, automatics, petrol and diesel, mostly up to £6000. We take great pride in the quality of service we provide, all cars come with pre delivery service and a valet carried out in our own workshop together with a 12 months MOT carried out at an independent garage and a 6 months Dealer Care Extended Guarantee through the AA warranty, which can be extended at an extra cost. We would not survive without the level of repeat business that we currently enjoy. Specialise in low mileage cars. Many cars undercover, come rain or shine. Easily accessible 4 miles from Norwich City and Station.